Microsoft’s Windows Phone 8 launch event was headlined by the appearance of Jessica Alba, but otherwise very little unknown information surfaced about the operating system or the devices it would appear upon. One smidgen of news that did emerge, however, was that a Samsung device, depicted by a lonely silhouette and named the Ativ Odyssey, was in the pipeline for a December release on Verizon in the US. Of course December came and went without a release, but CES gave Samsung the opportunity to show the 4″ Windows Phone 8 device to the world. 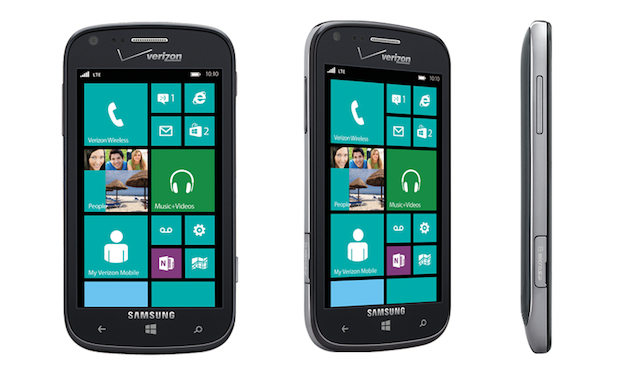 Now, a press release has stated that the phone will be available sooner rather than later, with stores set to receive the Ativ Odyssey and Valentine’s Day editions of the Nokia Lumia 822 and Motorola Droid Razr M tomorrow (January 24th). The Odyssey joins the Lumia 822 and HTC 8X in Verizon’s lineup of LTE Windows Phones, and its microSD slot and 2100mAh battery should win it some fans, although the 800 x 480 screen resolution and 5MP camera show that it is pitched towards the lower end of the market. As with almost all other Windows Phone 8 devices, the package comes powered by a 1.5GHz dual-core Qualcomm Snapdragon S4 chip accompanied by 1GB of RAM, and it will be available for $49.99 with a new 2 year contract, while whispers of a European launch remain unconfirmed but not impossible.